This entry was written by whyevolutionistrue and posted on October 31, 2018 at 9:30 am and filed under homophobia, Jesus and Mo. Bookmark the permalink. Follow any comments here with the RSS feed for this post. Both comments and trackbacks are currently closed. Two gay botherers telling it how it is, we’re truely fucked! This Thanksgiving my niece and her girlfriend will be there as usual and we have the added bonus of my cousin’s Salvation Army in-laws. It may alter the local weather pattern. Should be fun. GOOD LUCK! How about wearing a colander on your head? Always J & M marvelous. Does this strip get good media coverage or is it too powerful and sly for the newspaper, internet world? 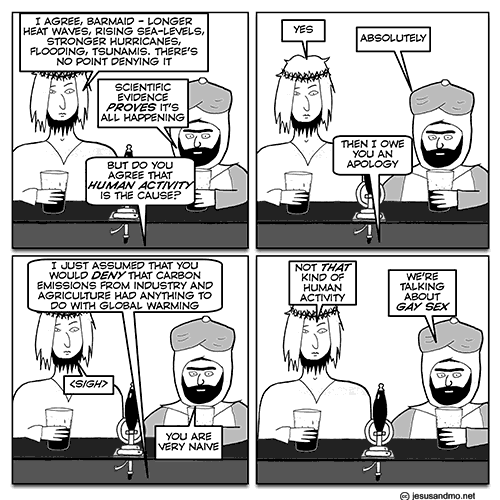 Jesus and Mo strip always makes me smile, and agreed – this is one of the best. Shouldn’t politicians who incite hate be charged with a crime? There are some politicians(and others) in the USA who do much the same. Shouldn’t they be held accountable? If murders are committed in the name of hateful speech, shouldn’t the speaker be condemned? How does humanity let this happen? Thew only problem is that the title of this thread is a spoiler. Ooooh, this one is sooo good! Indeed, possibly the best ever. Yeah, this is one of the great ones. I’m going to ask if he’ll sign this one instead of another I chose after sponsoring the artist on Patreon.